Tags: eba, rares only, challenge event. The Challenge Fairy is busy with Carnival season, but she still wants to visit with her favourite players! She's brought just the Rare challenge eggs with her! 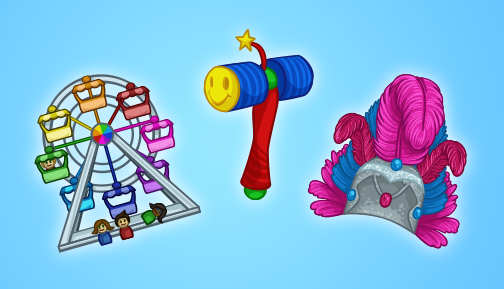 There will be 3 special challenges to win an Carnival themed Hammer, Hat and Trophy Room item! You will have 48 hours to try and win these prizes by completing the tricky challenges! The Squeaky Hammer adds More Multipliers! The Feather Headdress adds 10% More Stars! The Ferris Wheel Playset brings whimsy to any trophy room! For collecting all 3 prizes, you get a Carnival completion trophy for your trophy rooms as well! Good luck breaking! The challenge ends Friday August 28th at Noon PDT! Tags: new, objectives, descent, darkness. We heard you like a challenge. We heard you like a challenge so much that we're giving you not one, not two, but three new Descent into Darkness objectives. These are no ordinary challenges either. 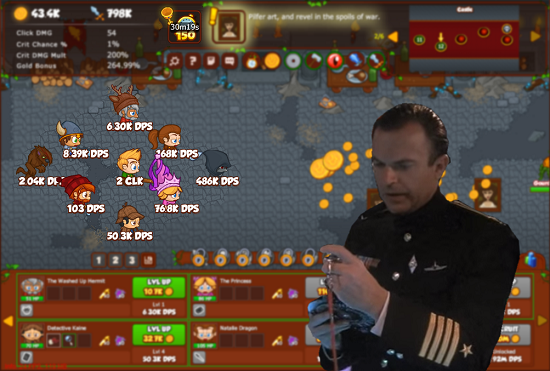 First up is an objective where you have to clear 200 areas with one Crusader. 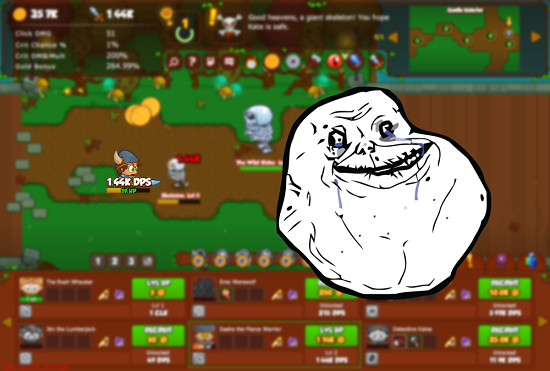 That's right, only one lonely Crusader can be used to clear all 200 areas to win the objective. In the event that even that grueling challenge is too easy for you, how about we throw in a timed challenge where you have 80 minutes to complete 150 areas. Do you have the best diamond formation to make it through in time? *maniacal laugh* Don't worry, if you have warp cards, you can use them to bust through a tough mob of enemies. What's that? You think that's too easy! Then your third objective is to complete 250 areas in a diamond formation with double the number of monsters and bosses per area! Have fun delving to these frenetic depths! Now begone and don't come back until you've finished them all. Tags: new content, event, eba, challenge eggs. Love between two people is quite special. Celebrate love and the magical unions that are weddings by helping the Challenge fairy fill her collection with a bevy of Wedding themed prizes in this all new burst event! For the duration of the event, special challenge eggs will temporarily replace all normal challenge eggs, and the eggs will appear at a higher than usual rate. 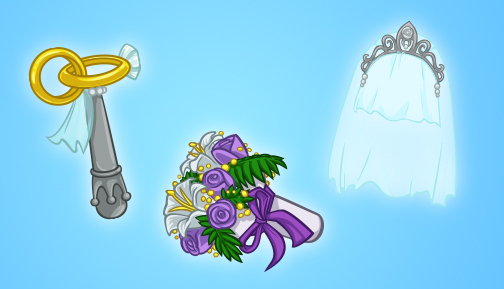 Players can earn 12 event prizes of various Wedding themed items from cashing in Event Tokens with the Challenge Fairy Monkey. The Veil Hat adds 10% More Multipliers. 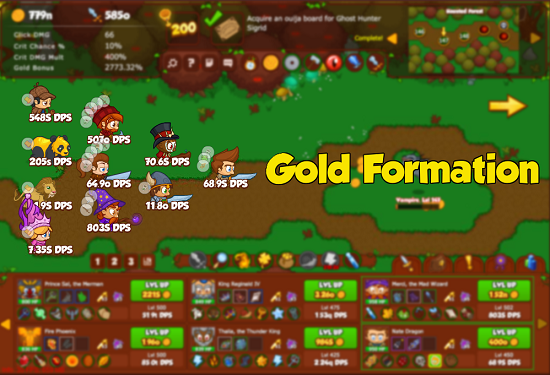 The Two Rings Hammer adds more Multipliers. The Bouquet sits pretty in any trophy room! Celebrate the union on the forums! The event will run until Monday August 24th at Noon PDT! Tags: new, full, screen, formation, saves, feature. We're always listening. Not in a sinister government type of way but listening to all your comments, requests in the forums, chat and emails. 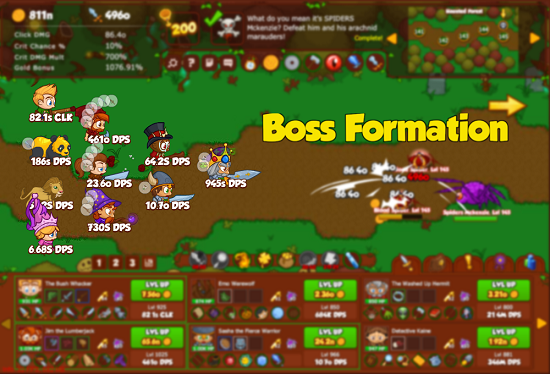 Today we unveil the number one requested feature by you the community: Formation Saves. That's right, now you can design and save up to three different formations. 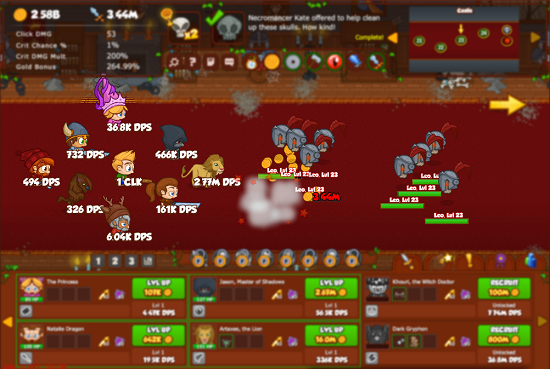 It's as simple as setting up your Crusaders for the task at hand whether it's gold farming, beating a boss or a clicker formation. Once you're happy with your set-up, hit the Save button just below the Crusaders and allocate the formation to a number. Better still it's easy to activate the saved formations. Either use your mouse on the all-new buttons just below your formation or use Q, W and E keys to cycle between them. No delays, no worrying about moving the Crusaders, just instant unbridled satisfaction. Even better, the saves are specific to each campaign. That means you have three different formation saves per campaign for added convenience. The other change we've made is adding a new full-screen option that can be accessed by using the Options drop-down or simply hitting the F key. Now you can enjoy Crusaders in all it's glory from screen edge to screen edge. Enjoy! Tags: new content, event, bw2, crusaders of the lost idles. The Commons is playing host to an inter-dimensional traveler and he needs your help! Since adventuring is what you do, he's looking for your help and the help of four other Bushwhackia citizens to join him as he tests out his machine and leads you all on a merry adventure! The others are a little reluctant to join though, so you need to go out and find things to persuade them to come along! Can you go through the portal before time runs out and grab the reward? Interested in learning more about the travelers crazy world and the adventures you had when you went through the device? Check out our all-new idle game, Crusaders of the Lost Idols! To go along with this mini quest, we're having a sale! Pick up a Jeweled Chest Ranch item which awards a random assortment of gold and gems every 20 hours! Plus 150 Bush Bucks and 2 VIP Vouchers, all for only $20! Talk about the adventure on the forums! 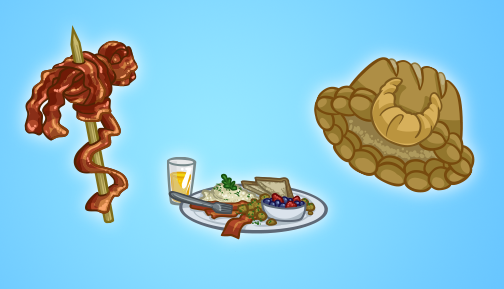 This quest-line will be available until Friday August 21st at Noon PDT! Tags: new content, bw2, wedding. Get out your fancy clothes! Find your favourite spiffy shoes! You're invited to a wedding! The cutest couple in Bushwhackia are finally tying the knot, and they need your help! If you've completed the Commons Election quest-line then talk to the Town Crier to get started. Seems there's a lot to do to prep for a wedding and a lot that can go wrong. But don't worry! It's a permanent addition to the game, so you can take your time! Lend your moral support to the loving couple to earn their reward. Share the love on the forums!